In order to validate the navigation functionality of LDACS for APNT in a realistic environment, two flight measurement campaigns were performed in November 2012 and November 2013. The goals of the first measurement campaign were (i) to demonstrate the accuracy that is achievable with LDACS communication signals in practical scenarios, and (ii) to validate the concept of LDACS-based navigation as a future APNT service. The future LDACS-based navigation service would require ranging to a minimum of four stations to estimate the aircraft position in 3D and the clock offset at the receiver. 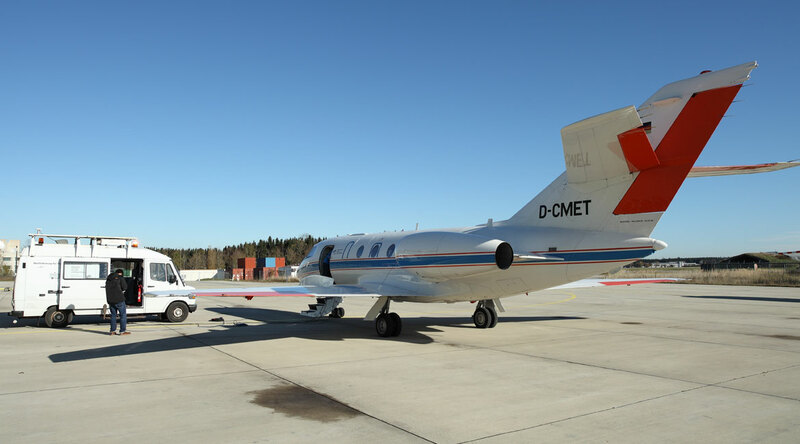 The measurement setup consists of four ground stations and a single receiver in a research aircraft - a Dassault Falcon 20E - provided by DLR. In this campaign the four ground stations were located in the area south-west of the DLR site in Oberpfaffenhofen. Each ground station was designed to transmit an LDACS forward link signal with 10W transmit power on different channels in the lower L-band between 965-975 MHz. The hardware components of each ground station included a rubidium (Rb) atomic clock reference, a GPS time receiver for off-line station synchronization, an arbitrary waveform signal generator to generate bandpass versions of an LDACS signal, and a power amplifier with appropriate bandpass filters to reduce out-of-band emissions. The Falcon aircraft was equipped with the recording equipment that was used to store the sampled LDACS signals transmitted from the four ground stations on a hard drive for further off-line processing. The figure below shows the locations of the four ground stations and the flight pattern. The aircraft flew on three different altitudes, flight level FL100 (≈ 3000m), FL280 (≈ 8500m), and FL380 (≈ 11500m). Hereby, the aircraft flies a ’butterfly’ pattern over the stations, using each station as a turning point. This allows for an analysis of different real world geometric constellations. The entire flight time is about 90 minutes. For presenting the estimated positioning error, we selected a two minute flight segment located inside the quadrangle built by the four ground stations. 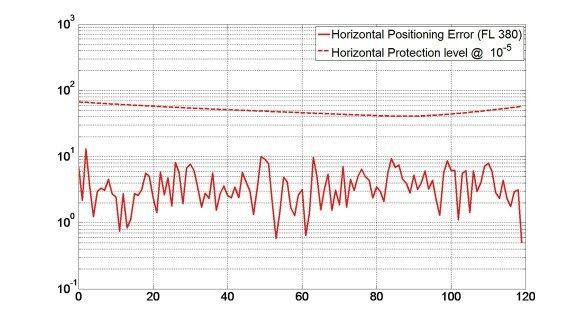 The resulting positioning error along with the evaluated horizontal protection level is shown exemplarily for FL380. It can be observed that the horizontal positioning error for the considered segment is most of the time below 10m, with the mean error being only 3.9m. Horizontal protection level for the integrity risk at 10-5 for this segment can be estimated as low as 67.1m. Taking into account that the APNT should accommodate the required navigation performance (RNP) at a level of RNP0.3, (which is approximately equivalent to 482m), the LDACS meets the APNT requirements with flying colors. During the first measurement campaign, we identified that the transmitted signals are subject to multipath interference that limits the ranging performance of the system. For an in-depth investigation of the multipath propagation impact on LDACS-NAV, the second measurement campaign has been realized in November 2013. The measurement campaign aimed at (i) investigating ground-to-air channel impulse responses with 10MHz wide signals, and (ii), assessing of the ranging performance with LDACS signals for different flight patterns as well as in the close vicinity of the airport. In what follows we show exemplarily two scenarios. The flight pattern for the first scenario is shown below. Several missed approaches have been flown, followed by flights over the runway at different altitudes (300ft, 400ft and 500ft ). The second scenario aimed at investigating the influence of DME signals onto LDACS. The DME station, used primarily for testing and training purposes by the German air navigation service provider DFS (Deutsche Flugsicherung GmbH) is located in Kaufbeuren, Germany. The flight pattern is shown below. During the measurements the airplane flew directly over the station at FL250.